Many families feel their relationships with their kids strained by excessive technology and media usage. It’s natural in today’s world, where every person – adults and kids – have connected smart devices. And just like any another obstacle, you need the right tools to help you manage. A contract is an easy way for the entire family to have a clear understanding of the household boundaries and expectations that you choose for your kids. A contract minimizes arguments with your kids, such as whether or not phone use at mealtimes is acceptable, or which devices you’ve agreed they can use and when. We all want what’s best for kids and that includes guiding them on appropriate etiquette and digital responsibility. Below is a quick list of ways a contract could be beneficial for your family. There is a lot of bad behavior online, especially on social media sites like Facebook, Instagram and Snapchat. It’s important to tell kids what is expected of them, what is appropriate and what isn’t. It’s in writing. It’s on paper. The contract is a tangible thing that you can keep on the fridge or by the family computer as a reminder of the rules. Because all family members sign this contract, everyone understands and agrees to the terms outlined. No ifs, ands, or buts. Part of raising good digital citizens is understanding that not all sites, apps and games are safe. Passwords need to be shared with parents and protected from strangers. Devices should be charged overnight in a common area in the house and children should never retire to their rooms with their devices, as this can deter from the temptation to engage in sexting or visit for inappropriate websites. Kids are learning so much on any given day and accountability is an important lesson to learn – and one that can be difficult to teach. By instituting a family contract, the rules are clear. So too, should the consequences of breaking any agreed upon rules. The contract is essentially a tool to communicate expectations clearly. You might wonder why that can’t be orally agreed upon. The answer: it can be, just be ready for a whole slew of issues. First, a spoken agreement is subject to miscommunication, words are often forgotten, misconstrued, or changed when they aren’t written down. A written copy of the contract makes the difference by eliminating ambiguity, confusion and forgetfulness over time. A written contract can always be referred to in the exact words in which it was agreed upon. 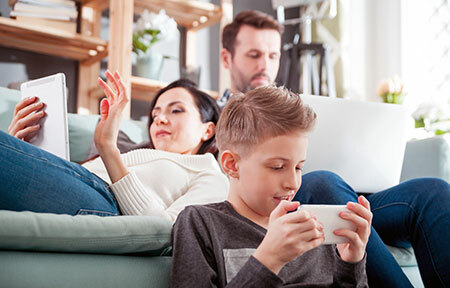 By downloading our Family Media Contract, you can create structure around your family’s digital use and online time spent to enjoy the benefits of technology. Download your copy of our Family Media Contract here.